Update: Please take our survey! Want to know how this project went? Check out the Post-Mortem. Your Link Master General has found a local (to me, in St. Louis), independent screen printing company that does quality work at a fair price. 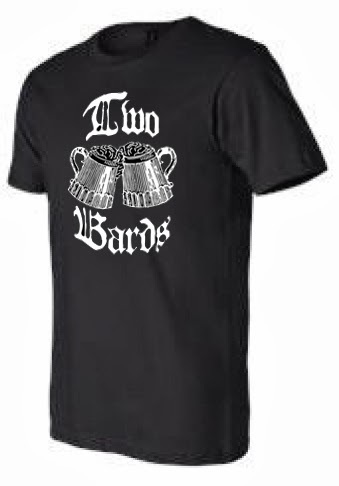 From now through Wednesday, February 19th (extended one week due to RadCon), I'm accepting pre-orders for Two Bards t-shirts! These shirts come in your choice of Black, 'Pebble Brown', or 'Steel Blue' and feature the Two Bards logo in white. T-shirts are unisex, short sleeved, 4.2 oz. 100% ringspun cotton jersey with shoulder to shoulder taping, coverstitched collar and hemmed sleeves (why yes, I did copy and paste that from the spec sheet). Shirts are $18 for XS-XL, $21 for 2XL-4XL. See the Finished Measurements chart for measurements (in inches). It's important to me that these t-shirts be better quality than those offered by expensive print on demand companies. It is also important to me that a portion of the funds from your purchase goes to the creative rather than the merchant. If we can get at least 24 shirts ordered, no less than 23% of the purchase prices goes directly to the creatives. Large orders decrease production costs, yielding a higher percentage for Scott and Andy. Orders will ship on Monday, March 10th via USPS Priority Mail. Delivery will be 2-3 business days for most US destinations and 6-10 business days for most international destinations. Unfortunately, shipping does take a bite. I can ship up to two shirts at the same rate, so if you are ordering more than two, contact me for a shipping quote. Priority Mail for US destinations is $5.80, Canada is $20.55, and all other countries (sorry Lotta and Moritz) is $24.75. An online survey will be sent to everyone who buys a shirt. If this works out, then we will do some tweaking (not twerking! we'll leave that to Dame Helen Mirren) based on your feedback and have more designs in the future. Q. Is there a "fit" on the t-shirts? Regular vs skinny or roomy? A. I'd say regular -- my recommendation is to take one of your shirts that fits you how you like, lay it out, measure its length and width, and then match that up with the Finished Measurements chart. Q. Why aren't you offering a women's cut? A. A men's/women's option was available, however, the men's sizes only went to 2XL -- too small for several listeners/buyers. FWIW, my wife prefers women's cut, but found this unisex a decent option. If there is enough interest we'll find a solution for the next run. Q. Why is international shipping so much? A. Priority Mail was the only way to get a single price and single delivery time for orders. For most countries there are cheaper methods, but they vary significantly in price and delivery times. If you are interested, send me an email with your proposed order (quantity, size, color) and your mailing address. I'll investigate options and send you a quote. 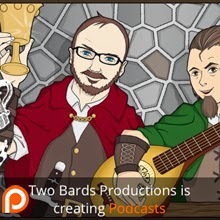 Two Bards, One Mic – Episode 42 RadCon 6B LIVE! !